Today I found out marshmallows were once made from the sap of marshmallow plants. Whether they are a hot chocolate topping treat, in the form of a sugar-coated critter, or roasting over a campfire, marshmallows are a favorite treat for many people. Marshmallows date back to as early as 2000 BC and were considered a delicacy deemed worthy only for gods and royalty. During those times, Egyptians made individual marshmallows by hand by extracting sap from a mallow plant and mixing it with nuts and honey. This delicious sweet developed a new form when, in the 1800s, candy makers in France took the sap from marshmallow plants and combined it with egg whites and sugar. The mixture was whipped by hand and took the form of the marshmallow we all know today. Since they were no longer reserved for people of high status, the demand for marshmallows among the public required candy makers to speed up the production process, so they developed a system known as the starch mogul system. The starch mogul system used corn starch molds to form the marshmallows. Additional changes to the recipe were also made. 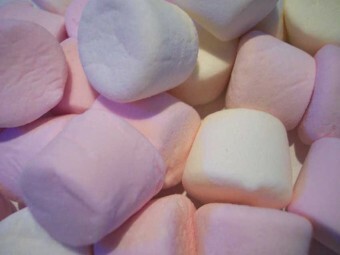 Candy makers replaced the sap taken from the marshmallow plant with gelatin, which enabled the marshmallow mixture to maintain its form and reduced the labor intensive process of extracting the sap from the mallow plant. The gelatin was combined with corn syrup, starch, sugar, gelatin, and water to create the fluffy texture of the marshmallow. The gelatin ingredient is essential in extending the shelf life of marshmallows because of the moisture it infuses into the candy. Thus, by replacing the previous egg whites with gelatin, marshmallows maintain their beloved elastic and spongy qualities much longer than they had previously. However, even with the advances in production and ingredients, the starch mogul system still wasn’t the most quick or efficient method to meet the demand of marshmallow consumers. In 1948, Alex Doumak took a huge step forward in technology by creating an extrusion process to make marshmallows. Through this process, the marshmallow substance was pressed through tubes, cut into equal pieces, cooled, and then packaged. No longer were they made by hand. The extrusion process revolutionized the production of marshmallows and allowed the candy to become an everyday treat to the general public. The marshmallow made its way to the United States in the 1900s and grew in popularity in the 1950s when it was used in a variety of recipes. Even though Americans were a little behind when it came to the marshmallow, they are now the number one consumers of the fluffy candy, buying more than 90 million pounds per year, which is more or less equivalent to the weight of almost 1,300 adult gray whales. The official name of the mallow plant is Althea officials and it is a pink-flowered plant. Marshes are the native growing ground for the mallow plant; hence the name marshmallow. Mallow plants are native in Asia and Europe and are also grown in eastern United States. In the 1800s, the sap of mallow plants were not only used to make marshmallows, but doctors also used this sap to soothe colds and sore throats. We all know marshmallows are a favorite in hot chocolate or crammed between two graham crackers and a chocolate piece, but did you know that some people also like to freeze them and eat them as a pizza topping? Like the original marshmallow, Marshmallow Peeps were once made by hand by being squeezed one at a time through a pastry tube, and the eyes were painted on by hand as well. With this process, it took 27 hours to create one Marshmallow Peep. Thank goodness for technology. Today, it takes about six minutes. Over 50% of marshmallows sold during the summer months are toasted over a fire. Bring on the s’mores! The Girl Scout Handbook published the first s’more recipe in 1927. The Girl Scouts are considered the ones responsible for naming the roasted marshmallow, graham, and chocolate treat. The s’more name most likely stands for ‘gimme some more’. The majority of marshmallows are sold between October and December. What weighed 1,600 pounds and consisted of 20,000 toasted marshmallows and 7,000 chocolate bars? The largest s’more ever made. This record for the largest s’more was achieved in 2003. Marshmallows were once the standard of the Tournament of Roses Parade route. Growing up in SoCal it was a ritual that you and your senior high school class spent New Year’s Eve (NYE) camped out for the New Year’s Day Parade. Since kids used to line up a day or two in advance they got bored. So they used to have “batles” using marshmallows. Then they started throwing them at passingcars since the streets were still open. The Pasadena City Council passed an ordinance banning marshmallows. Kids switched to torillas. Now banned. Can’t start to camp out until 6PM NYE. It has gone so politcally correct the tradition has been lost. Perhaps you mean to say what started out as a simple tradition by some youths has degraded to an eyesore and expensive cleanup to the city, who had to ban such activities when the fun went went beyond the available resources to return Pasadena to its original state (before marshmallows or tortillas littered the streets)?